The Robinson R44 Raven II is a four-seat light utility helicopter powered by a single fuel-injected, angle-valve, tuned-induction, Lycoming IO-540 piston engine. The Robinson R44 is built and developed by the Robinson Helicopter Company in Torrance, California. Design of the Model R44 began in 1985. The first prototype flew on 31 March 1990 and the second in January 1991. Sales efforts got under way in March 1992 at a base price of 235.000 US-Dollars. FAA Type Certification for the R44 Astro was achieved on 10 December 1992, and the first Robinson R44 Astro was delivered in February 1993. In 2000, the R44 Astro was replaced as the main production model by the hydraulically-assisted R44 Raven. The development from the first R44 Astro in 1993, via the R44 Raven I to the first R44 Raven II delivered in 2002, has been remarkable. For the pilot the most important difference is the conversion from a carbureted engine on the Astro to injection and hydraulic controls on the Raven II. Over 6400 of the four-seat Model R44s are delivered to customers all over the world. The ICAO Aircraft Type Designator for the R44 Raven II helicopters is R44. In May 2009, Robinson R44 Raven II c/n 12774 was seen first in Germany at Cottbus / Neuenhausen airfield with registration D-HAJK. 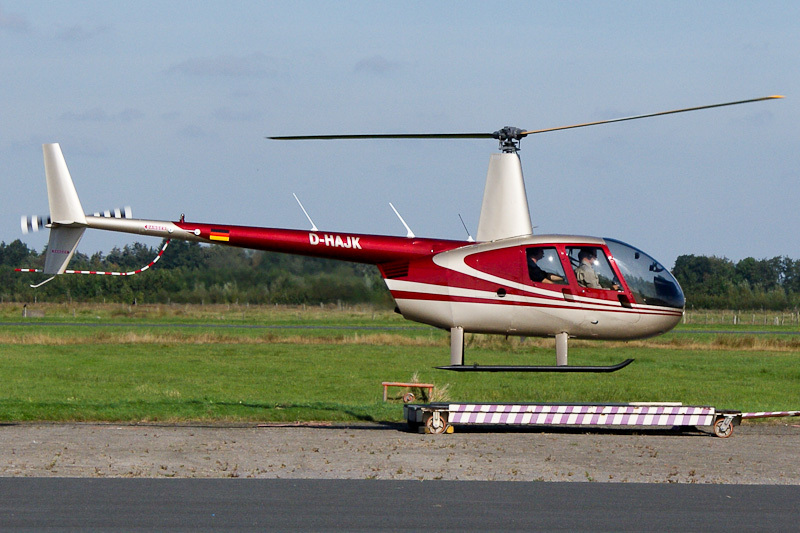 The same year, the 2009-built Robinson R44 Raven II D-HAJK was based at Flugplatz Emden. On 15 May 2012, the Robinson R44 Raven II was registered 4X-BER in Israel. On 18 September 2009, the D-HAJK was seen in service at Flugplatz Emden.